Go to amazing cave. Enjoy fresh water and unique cave. Jump in, cool down and wash off but not for long! Then, the longest stretch of your drive is also the largest contrast. From the hidden countryside cave, we retrace our muddy path, and then some, to the pristine beach. Macao Beach. One of the last ‘resort free’ coastal stretches of Punta Cana, Macao is the idealistic Caribbean shore with amber sands, rows of coconut palms and azure waters. We will drive you to your pick up point. Pick up time and location vary depending on the hotel or pick up point. We will contact you with the exact location. Ranch visit with organic coffee and cacao shop. Pushy vendors on Macao beach. I would avoid them. Sometimes transportation is a mess, but what you pay is what you get. How to avoid it? Book it private! Amazing driving activity. You will have a lot of fun. Macao beach – one of the most beautiful places in the DR. Attention: There are no age restrictions. But you must be 18 years old to drive! What are you waiting for? Buggies are insanely popular in Punta Cana. 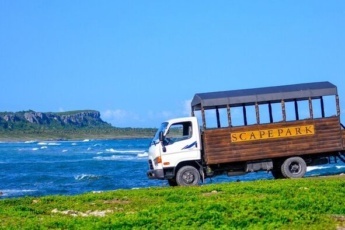 Book buggy adventure Punta Cana now to guarantee your reservation. I still can’t work out how we didn’t fall out of the jeep while taking pictures. loved the stops and all the knowledge of the road. We especially loved the off road part of it and I have the bruises to prove it with how much he bumped us about all. thanks for a great trip. Was this February with my friends who by the way are thrill seekers, I usually wouldn’t engage in such an adventure but looking back, it was worth it. The guides also ensured all safety precautions as I nagged on and on about how unsafe it was and we all were going to die ahaha. 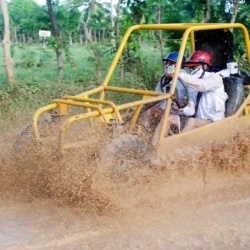 What activities does Buggy Tour Punta Cana include? 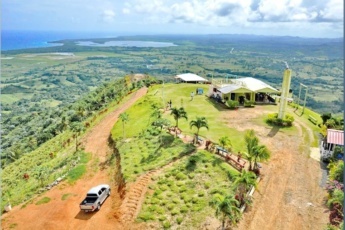 Apart from unique driving experience, you will enjoy a real Dominican rancho, Tainos Lagoon and Macao beach - one of the most beautiful beaches in the Dominican Republic. Book our Fun Buggy Punta Cana and enjoy an unforgettable experience! 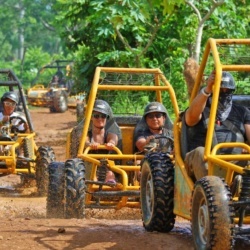 Is it necessary to cover face during Xtreme Buggy Punta Cana tour? 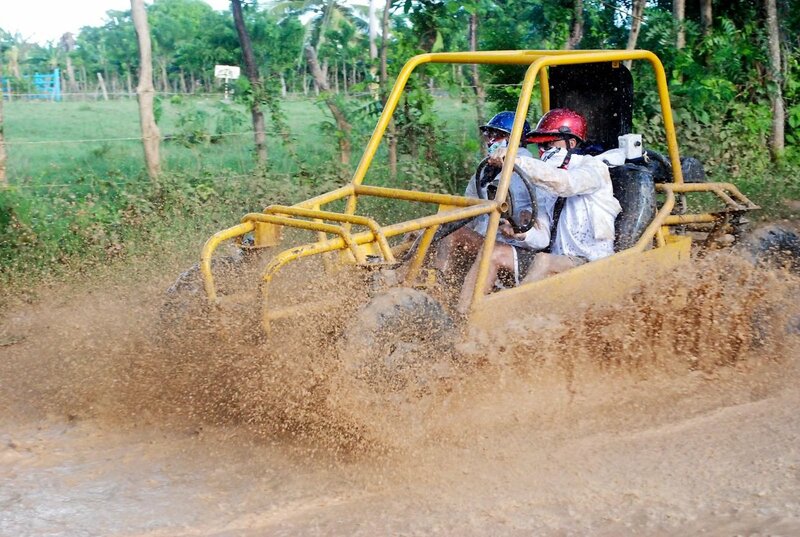 Yes, it is necessary to have a bandana or small towel not to let dirt and mud cover your face during Xtreme Buggy Punta Cana tour. 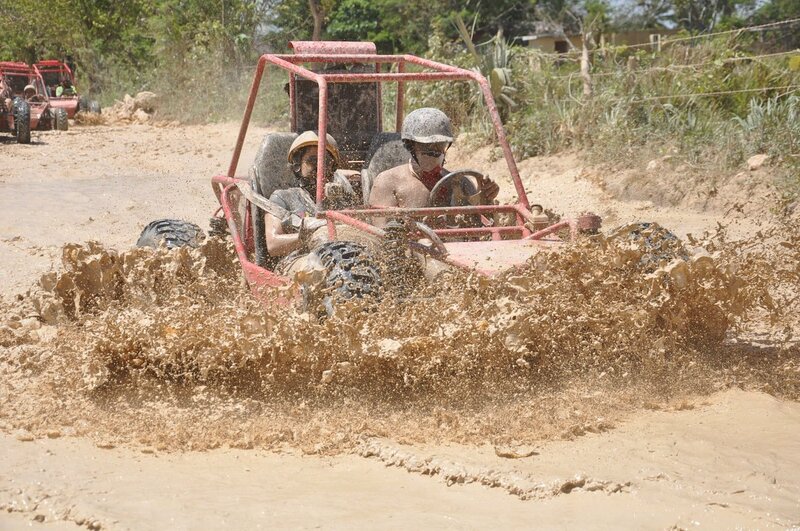 Who can go to experience Fun Buggy Punta Cana? 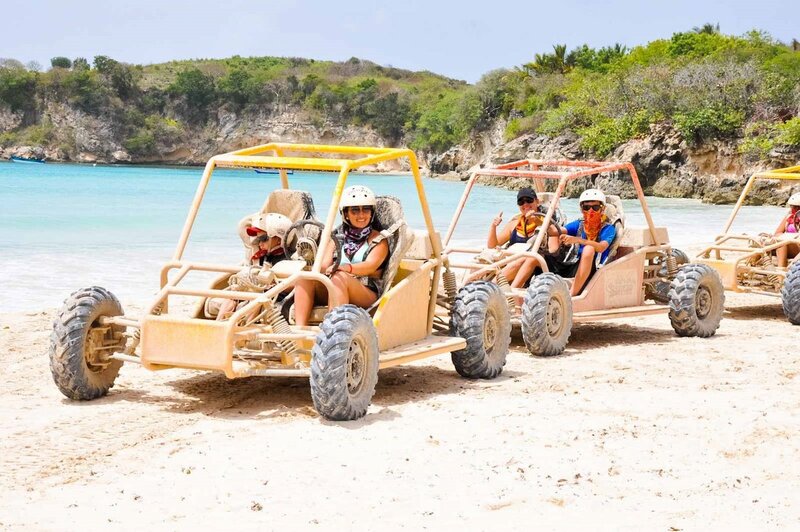 There are no age restrictions to go on Xtreme Buggy Punta Cana tour. But you must be 18 years old to drive our Fun Buggy Punta Cana. 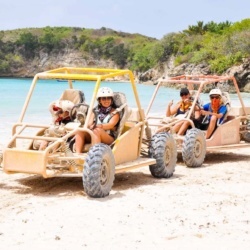 Is Xtreme Buggy Punta Cana excursion a private tour? Buggy tour Punta Cana is a group tour. In case you need a private Buggy Tour Punta Cana, please contact us directly. We provide personalized service in Punta Cana and will be glad to help you. What should I bring to go on Buggy Tour Punta Cana? To go on our Buggy Tour Punta Cana we would recommend you bring old clothing. swimming suit, bug spray, flip flops or water shoes, sunglasses or goggles, bandana or small towel to cover your face, towel, camera, sunscreen and some cash. Does Buggy Tour Punta Cana include trasportation from and to hotel? Our Fun Buggy Punta Cana tour includes pick-up and drop-off from any hotel or area of Bavaro/Punta Cana. We will contact you to inform you of the details. Can I go on Xtreme Buggy Punta Cana tour if I do not have experience in driving a buggy? To go on Xtreme Buggy Punta Cana tour you do not need to have experience in driving a buggy. The only requierement is to be 18 years old to drive. Should I take some money to go on Buggy Tour Punta Cana? Is Xtreme Buggy Punta Cana safe? 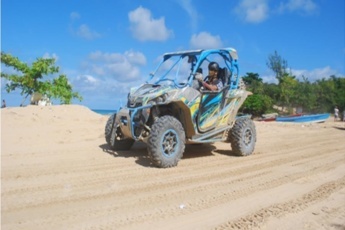 Yes, Xtreme Buggy Punta Cana is one of absolutely safe Punta Cana Adventure Tours. Moreover, you will be accompanied by a professional guide. 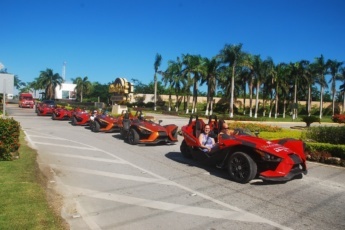 Is this Dune Buggy Punta Cana tour a half-day excursion? 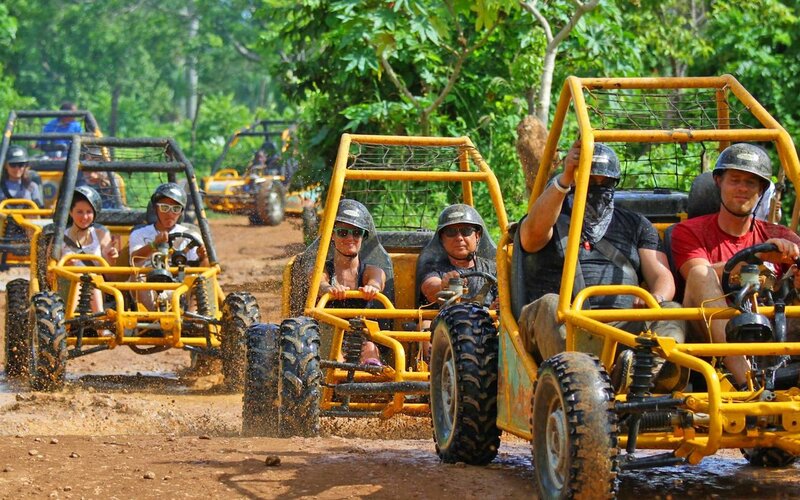 Dune Buggy Punta Cana tour lasts about 3-4 hours and it is one of the Best Half Day Tours Punta Cana.